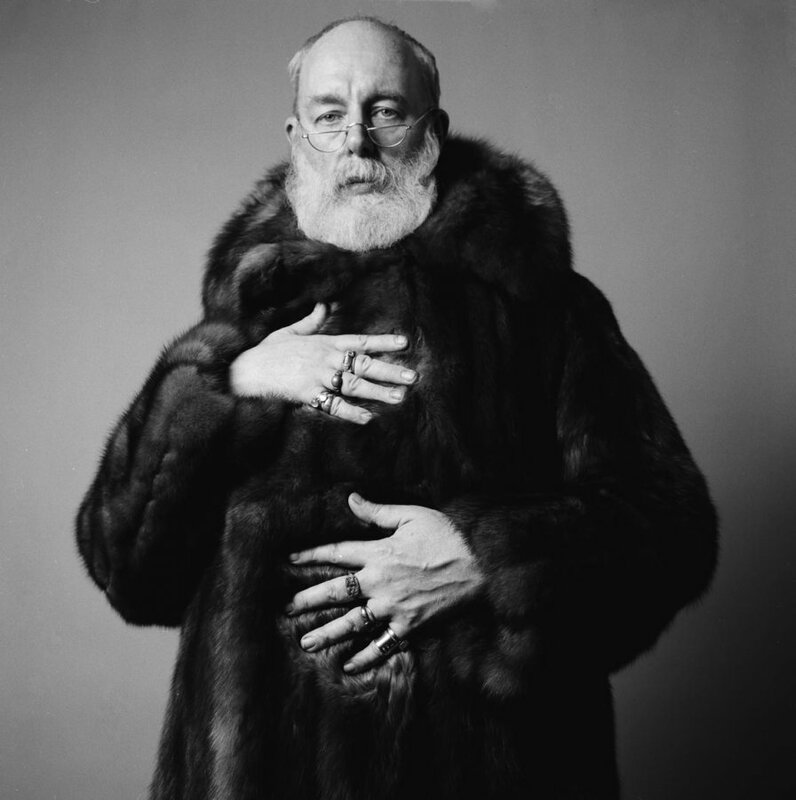 We can’t imagine a better artist to highlight in the month of October…… than Edward Gorey. His illustrated stories teeter on the crevice between the hilarious and the horrific, the delightful and the dreadful. Gorey’s characteristic pen-and-ink drawings often depict vaguely macabre narrative scenes in Victorian/Edwardian settings. His illustrated, often wordless, books have an ominous air that have developed a cult following. 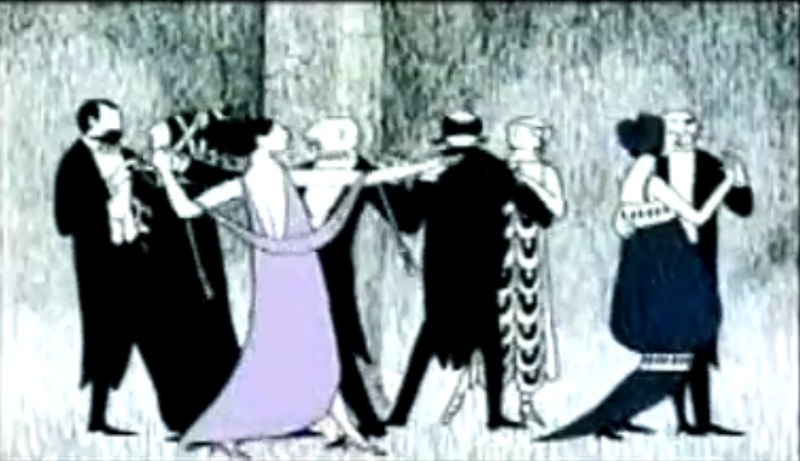 But it was Gorey’s animated introduction to the PBS series Mystery! 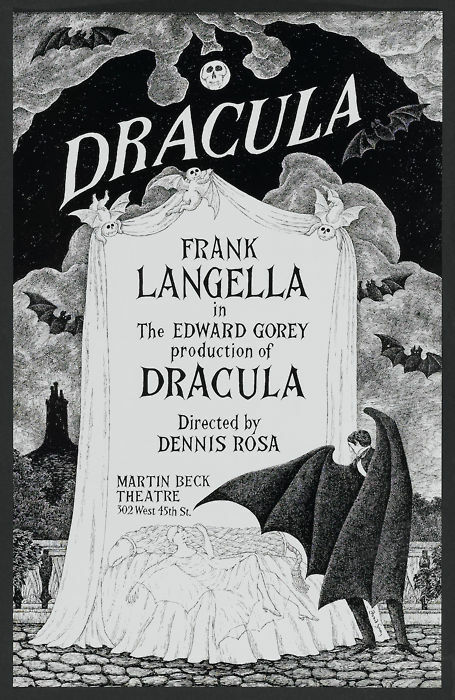 in 1980, as well as his art direction for the 1977 Broadway production of Dracula, that won him a worldwide fanbase….Oh, and a Tony award for Best Costume Design. 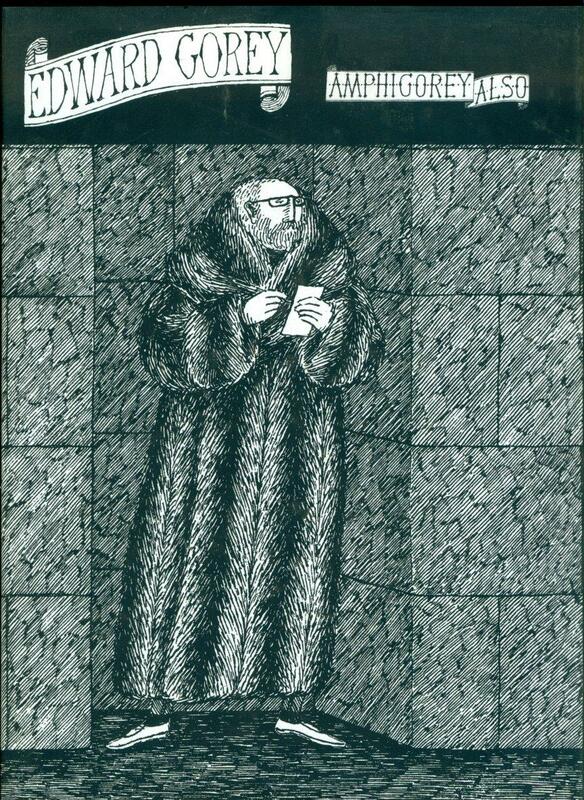 Gorey graduated from Harvard University in 1950 with a focus in French. He frequently stated that his formal art training was “negligible”; because he’d only studied art for one semester at the Art Institute of Chicago in 1943. From 1953 to 1960, he lived in New York City and worked for the Art Department of Doubleday, illustrating book covers and in some cases, adding illustrations to the text. He illustrated works as diverse as Bram Stoker’s Dracula, H.G. Wells’ War of the Worlds, and T.S. Eliot’s Old Possum’s Book of Practical Cats. All of which seem to have influenced his art, …….which he classified as “literary nonsense”. 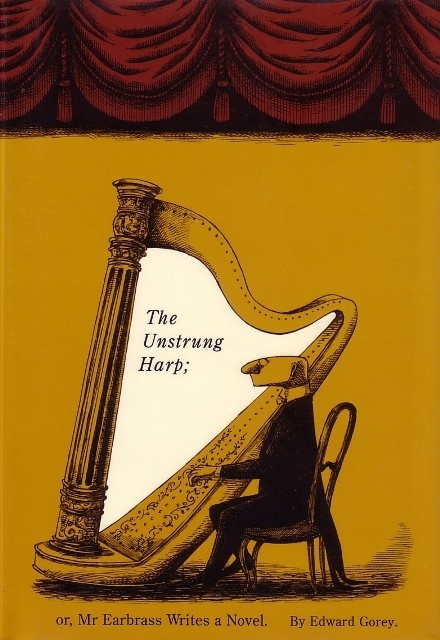 His first independent work, The Unstrung Harp, was published in 1953. Almost 100 more books followed that first one. He was also published under pen names that were anagrams of his first and last names (like Ogdred Weary, Dogear Wryde, Ms. Regera Dowdy, and dozens more). 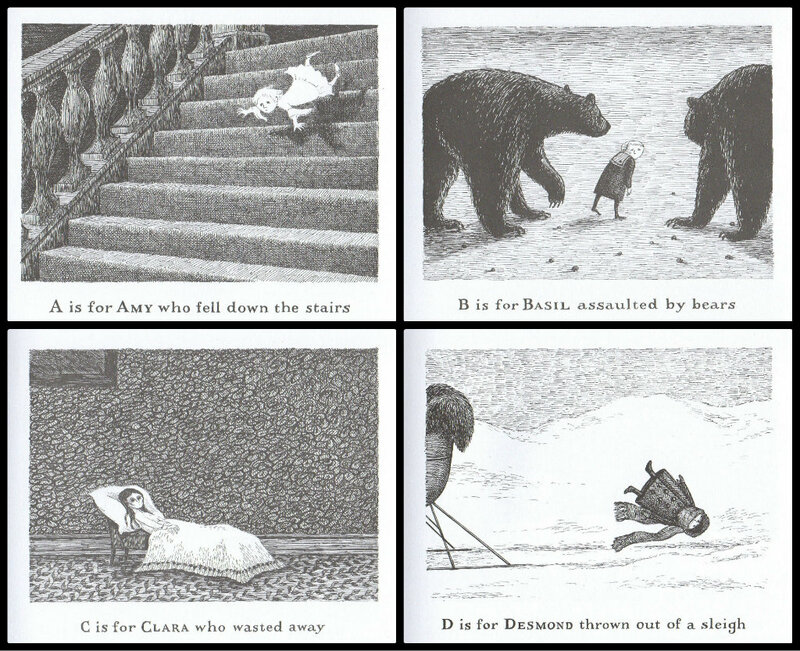 Gorey loved word play. 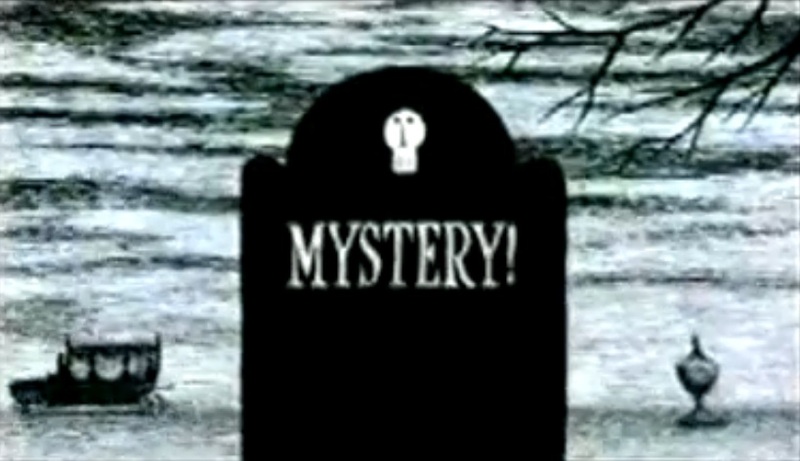 Gorey didn’t actually animate the PBS Mystery! opening sequences. They were done by animator Derek Lamb. But he provided elaborate notes and sketches that would have made a 30 minute movie by themselves. I found the clip on YouTube. Even Gorey’s view of Christmas has a slightly ominous wit about it. 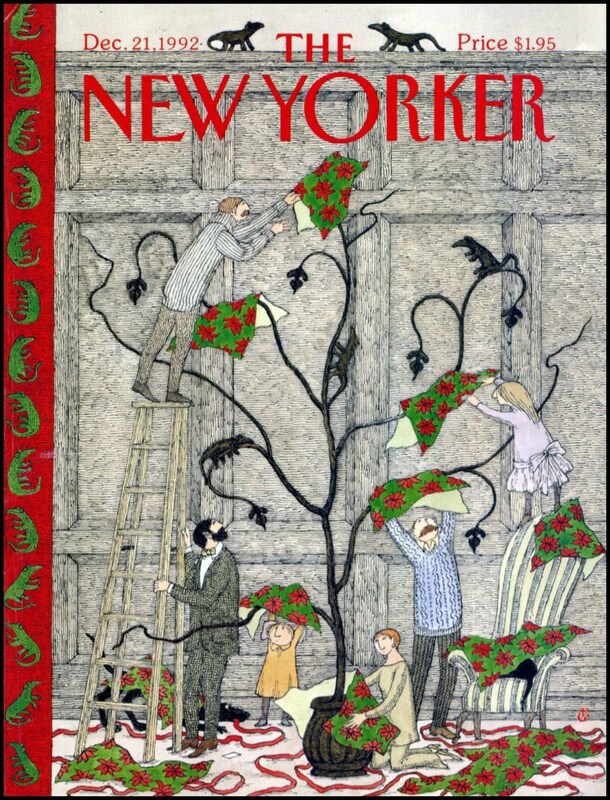 Here’s his cover of The New Yorker in 1992. 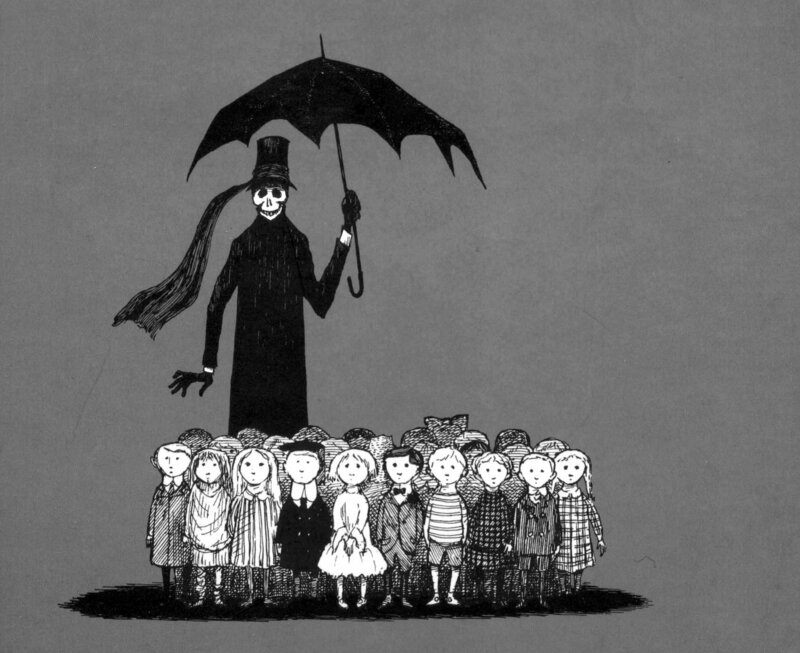 One of my favorite Edward Gorey books, and soon to be yours as well, is The Gastlycrumb Tinies. 26 children die gruesome and odd deaths in alphabetical order ….. it’s an anti-children’s book for adults. I don’t want to ruin the next 22, you will just have to read them for yourselves. In his later years, Gorey lived year-round in Yarmouth Port, Massachusetts, on Cape Cod, where he wrote and directed numerous evening-length entertainments. He performed these shows for dinner guests with his own papier-mâché puppets, an ensemble known as Le Theatricule Stoique. Gorey was noted for his fondness for ballet (in 30 years he never missed a New York Ballet performance), fur coats and Converse tennis shoes (always worn together), and cats (of which he had many). Gorey was also an unashamed pop-culture junkie, avidly following soap operas and television comedies as broad as Petticoat Junction and Cheers. But he had particular affection for dark genre series like Buffy the Vampire Slayer, Batman: The Animated Series, and The X-Files. 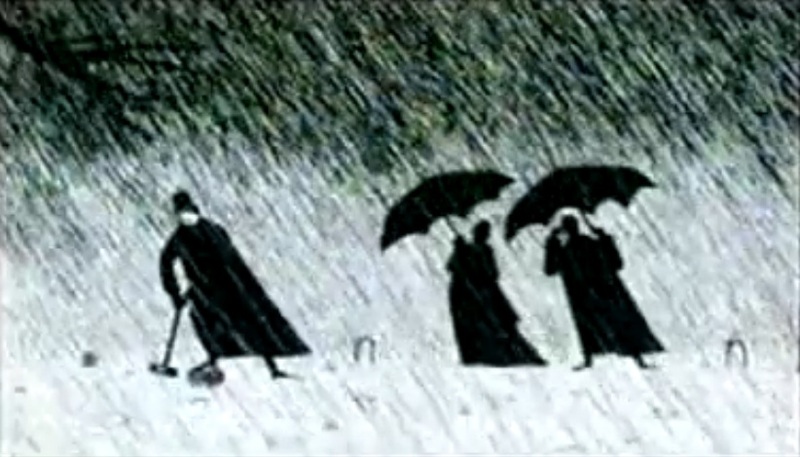 Gorey once told an interviewer that he enjoyed the Batman series so much that it was influencing the visual style of one of his upcoming books. He treated television commercials as an art form in themselves, even taping his favorites for later study. (I do that, I could watch some commercials over and over) Gorey loved movies, and even wrote regular reviews for the Soho Weekly……. Of course under a pseudonym – Wardore Edgy. 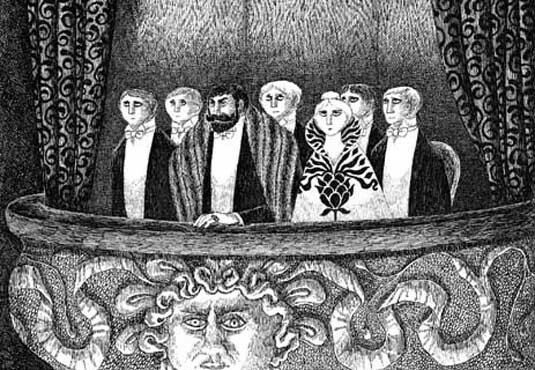 Gorey’s work continues to influence Tim Burton, David Lynch and even Lemony Snicket’s Daniel Handler. 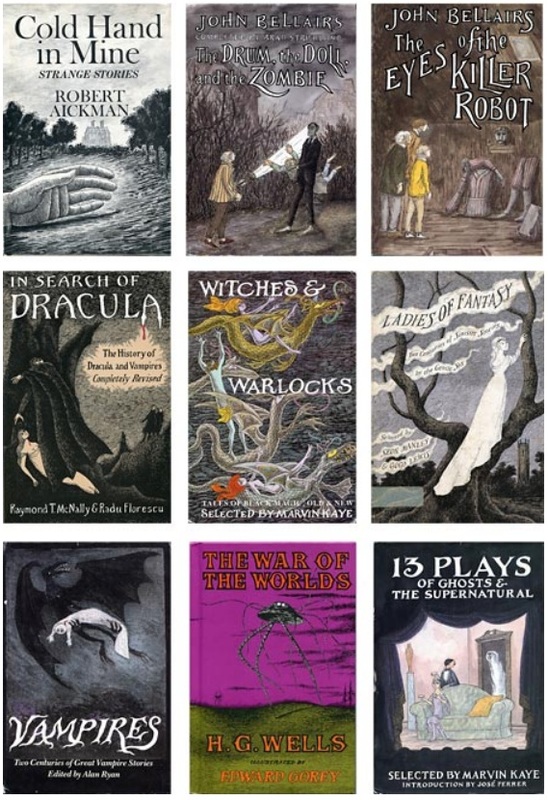 With his own inspirations as diverse as Edgar Allen Poe, Charles Addams, Charles Dickens, Lewis Carrol, Agatha Christie and Batman Beyond, Edward Gorey’s works will continue to delight …..and quite possibly frighten…..for decades to come. and I’m pretty sure that he wanted it that way. 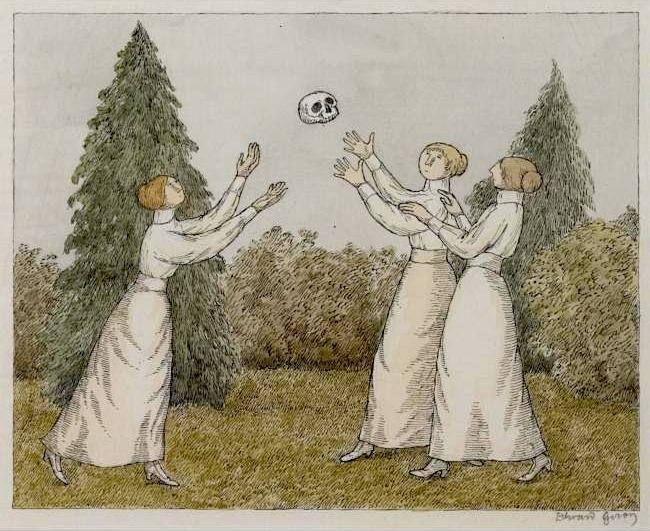 Wanna read more about Edward Gorey? I hope you do. I found an excellent PBS interview by Ron Miller…you can read that here. I love that book. I just bought it for baby Maddy for her first Halloween, and it sparked the whole write-up.